A gypsy card reading might be a diverse experience than say, a tarot card reading. A gypsy card reading tends to cut through into the more emotional issues of life, rather than the spiritual or psychological depths. A gypsy card reading is still a fortune telling tool, a magical one, a wondrous one but a basic one. You want to know when your boyfriend will call; whether he truly loves you and if the other woman is going to leave him. A gypsy card reading will tend to give you direct answers. A tarot card reading will dig into the undercurrents. Now if you are not an “undercurrent” kind of person, and could not give “a monkey’s” as to why your relationships tend to go skew whiff, the gypsy card reading could be a solution for you. The Romany people have no roots; their culture is based on strong survival instincts, their connection to the “wylde” helping them overcome odds on a daily basis. They have no need to go into the deeper “reasons”; they need to know the way the wind is blowing “before now!”. “Will clouds form over my marriage?” “Will the sun come out for my true love?” “Will the rain drown my fortune?” The Romany people are in touch with the forces that be; life is a minute to minute event, the future has to be straightforward and accessible. No matter how fancy the cards, the answers remain basic. You will be told facts when you go for a gypsy card reading. If your boyfriend has left you, and he is not coming back, the gypsy will tell you straight up, with little reasoning as to why. The gypsy card reading is not too worried why. Facts are facts. Gypsy culture forbids the word death, maybe because survival issues are so pitiless. If anyone flaunts the basic Romany rules high prices are to be paid, like isolation from family or community. Good and evil are clearly defined in Romany reality and dwelling on the past is considered a waste of time. Finding a pure blood Romany to do your card reading might he like looking for “a needle in a haystack”. Companies value a gypsy card reader but you might have to ask for one or book ahead. Sometimes a gypsy will have created her own pack of cards, initiating them in magical ways originating from Indian culture (part and parcel of the Romany genetic code). A modern style Romany could also use packs such as the Authentic Gypsy Tarot Card Deck. But the original gypsy decks only have 36 cards; most other decks are variations on a theme, based on the authentic pack originating in Hungary. A gypsy card reading will not use the Celtic Cross layout, but quite complex layouts that leap into future timescales and dwell little on the past. The general public know what they want in terms of a card reading these days. Often more savvy than folks some ten years ago. They expect psychics to give them in-depth advice, rather like a counsellor but also see into the future. 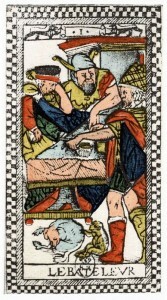 Therefore the gypsy card reading might not fulfil all their requisites. But if you want a sharp, to the point, frequently more than accurate response, you will find that a gypsy card reading is just right for you. The ball is in your court!